In the south, we love to entertain. Whether hosting intimate Sunday suppers or formal soirees, we pride ourselves on being gracious hosts and paying keen attention to detail. 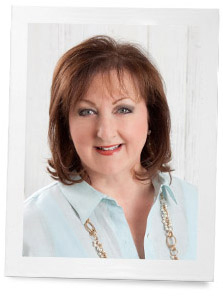 Of course, most gatherings would not be complete without our favorite recipes, and assembling a lineup of delicious dishes is frequently the focus of the Southern hostess preparing for company. 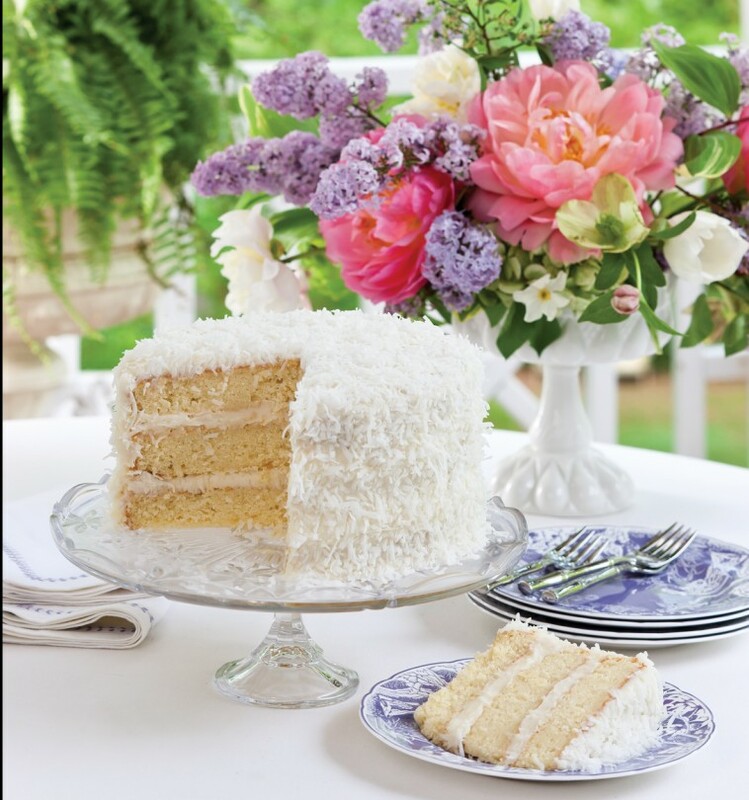 This stunning Coconut Cake is one of many delectable recipes found in The Entertaining Cookbook Volume 2. Whether you are planning simple meals or a formal gathering, this is the book to help you make every occasion special and memorable. This bound, keepsake edition puts all your favorite recipes at your fingertips. Pretty table settings, a beautiful flower arrangement, and flavorful dishes add a special touch to any occasion shared at home. 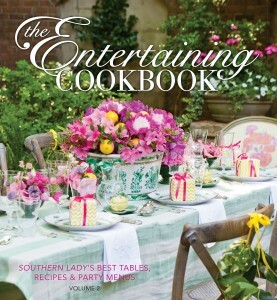 Right now, we’re offering Ribbon in My Journal readers free shipping for The Entertaining Cookbook Volume 2 with the code ENTERTAIN. Preheat oven to 350°. Spray 3 (9-inch) round cake pans with baking spray with flour. Line bottoms of pans with parchment paper, and spray again. In a medium bowl, beat butter and sugar with a mixer at medium speed until fluffy. Add eggs, one at a time, beating well after each addition. Beat in coconut extract and vanilla. 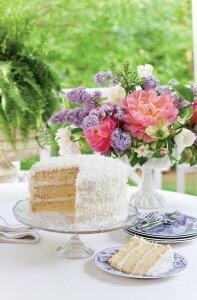 Place one cake layer on a serving plate; spread 1 1⁄2 cups Coconut Icing over layer. Sprinkle with 1 cup coconut. Repeat procedure once. Top with remaining cake layer. Spread remaining Coconut Icing on top and sides of cake. Immediately press remaining coconut onto top and sides of cake. Refrigerate for 1 hour before serving. In a large bowl, beat cream cheese and butter with a mixer at medium speed until creamy. Gradually beat in confectioners’ sugar until smooth. Beat in coconut extract. What are your favorite “company-worthy” recipes? This cake is wonderful when made with the correct recipe. Unfortunately this version of the recipe has several errors in it in addition to the error with the flour. I have got to make this cake!! I have got to get this book!! Just a note regarding the ingredient list for the Coconut Cake. The recipe on the blog calls for 3/4 C flour. It should be 3 3/4 C flour. Thanks for always publishing beautiful articles. I truly look forward to each one! May you and your family have a blessed Easter! HE IS RISEN!